The Krone von Lech, your romantic hotel on the Arlberg, is a very special holiday residence. 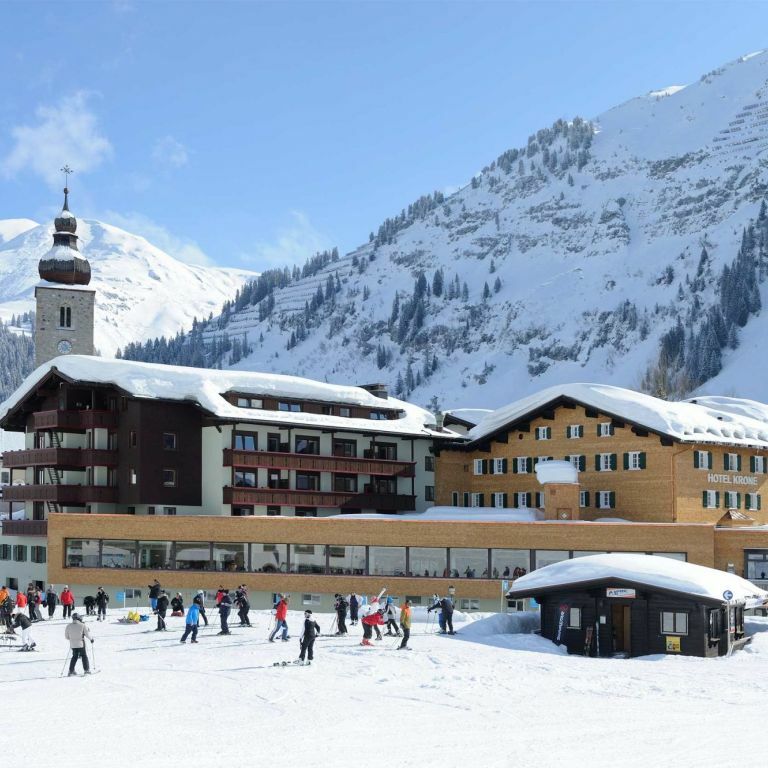 Thanks to its charm and elegance, it provides a sophisticated yet friendly base for your holiday on the Arlberg. Lech am Arlberg received its 'crown' four years before Maria Theresia was crowned Empress of Austria. Back then, in 1741, the 'Die Krone von Lech' was mentioned in documents for the first time. It was once a popular rest stop for travellers tackling the then arduous route over the Arlberg. Today, well-developed roads lead gourmets, skiing enthusiasts and hikers from all over the world to Lech and the 5-star Hotel Krone. The Pfefferkorn family have been running the Romantik Hotel Krone von Lech for five generations and are renowned for being exquisite hosts: the Krone von Lech is a discrete and cosy refuge at the heart of Lech which suits even the most discerning guests. Surrounded by majestic mountains and in the midst of all the activities of this classy winter and summer holiday resort, the Romantik Hotel Krone provides its guests with a top spot in one of Europe's most beautiful villages. 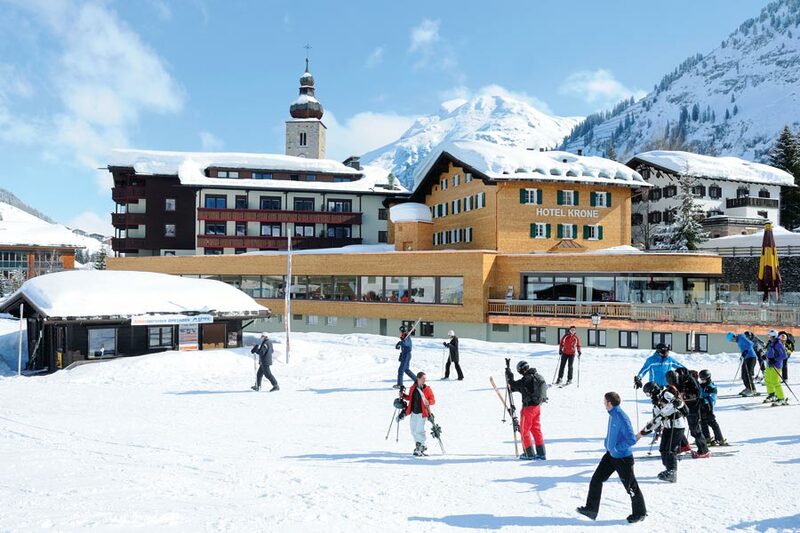 The Arlberg is almost close enough to touch from your 5-star hotel in Lech. In winter you can enjoy the luxury of being one of the first on the ski lift. This is situated directly opposite the skiing and well-being hotel: the motto here is 'ski in ski out' on the Arlberg. The holiday village is no less charming when the snows start to retreat from the peaks of the majestic mountains and summer makes its way into Lech: a programme of activities to satisfy both nature and mountain fans awaits here, right on the hotel doorstep. Every king has his castle: and at the Wasserschlössl (water castle), the 1,200 m2 large well-being area at the Romantik Hotel Krone von Lech, you can savour some tranquillity, comfort and relaxation. With a pool, sauna area, gym and superb treatments – what more could you want? The Pfefferkorn family carefully pairs historic charm with all the conveniences of a modern 5-star hotel. Gourmets love the Genusshotel Krone: three restaurants, awarded 2 Gault Millau toques, 3 stars, 85 points in the à la Carte Gourmet Guide and 3 forks and 92 points in the Falstaff Gourmet Guide, not forgetting its well-stocked wine cellar for some delightful gourmet moments.